SNAP OUT OF IT. So iconic, so 80s. This was Cher's BIG comeback (and such a woman's fantasy: "I can't do that." "Why not?" "I'm in love with you." swooooooon.). I guess this was before Nicholas Cage revealed himself to be more interested in making myself a cartoonish joker of an actor than a serious actor? This. Movie. Was. Big. And the joy the Boomers (always, always the Boomers, esp. in 1987) received from Dean Martin's song being put in. Here's Cher winning the Oscar for Moonstruck (and some Chevy Chase/Paul Newman schtick). This was basically a Cher vehicle, although the whole cast are spectacular. (My favorite Cher movie is Mask, a great movie!) She was up against Glenn Close for Fatal Attraction and Holly Hunter for Broadcast News - and she won! Nice post, and I look forward to the discussion. Reading Rachel Handler's mini-review made me go watch this movie again, even though I watch it twice a year, anyway. Yeah, so, anyway, Rachel Handler is tearing it up over at The Dissolve. Everyone should go read what she writes. This movie is the best. I remember seeing it in the theater with my parents when I was 8 years old. We still quote from it constantly. My dad and I always do the "I'll say no more." "You haven't said anything!" "And that's all I'm saying." bit all the time. Also "Somebody tell a joke!" whenever it gets quiet at the dinner table. I still get choked up at the very end with the "Alla famiglia" toast and the soaring music and ahhhhhhh so good! I could probably recite the whole movie right now. "SNAP OUT OF IT!" is still just the best. You don't know how many times I have wanted to say it IRL. And yeah, Cage is at his best here, ever. He goes from a crazy angry guy going on about his hand to.... the bed. And the opera. And she loves him something awful. Oh, that's no good! Trivia note: Look for Martin Scorsese's mom (Catherine Scorsese) leaving the bakery. This completes the Mi Familia Universe, as she is in Moonstruck, The Godfather (part 3, I know) and Goodfellas. I just rewatched this recently and had to look up the ages of the actors. Olympia Dukakis was not quite old enough to be Cher's mother but Cher and Nick Cage were a kind of May/December romance. He was only 23! And she was 41, I think. Yet another reason to love this movie. "Old man, you give those dogs one more bite of my food and I'll kick you till you're dead!" This movie made me want to go see an opera. At the time I did like classical music, but hadn't warmed to opera. Then shortly after it came out I went to college and ended up friends with a few opera singing students, and pretty soon I was a real Puccini fan. Cosmo Castorini: What's the matter, Pop? Came here for "COSMO'S MOON!" and was not disappointed. I also don't think Danny Aiello gets enough credit for his part in this movie. I had several Italian-Ameriacn uncles & great uncles who were just like him. Essenntailly sweet but clueless and completely out of step with the world they found themselves living in. "Moonstruck" had an enormous influence on 22-year-old me. I moved to the Cobble Hill/Carroll Gardens area a couple of years after "Moonstruck" came out... and was so thrilled to buy baked goods at Cammareri. Sadly, Cammareri isn't there any more, but the fond memories of my time in Brooklyn remain. And man, do I miss seeing Cher on the big screen. The dream of the nineties is alive in Danvers. Whenever I have someone over to do work on the house I always remember the scene with Cosmo and the yuppie couple. And yeah, this movie is Peak Cage. Peak charming Cage AND peak crazy Cage! I just watched this last week! I was thrilled that it was as good as I remember it. It also made me want to go to an opera. "A BRIDE WITHOUT A HEAD!" "A WOLF WITHOUT A FOOT!" "...but Cher and Nick Cage were a kind of May/December romance. He was only 23! And she was 41, I think. Yet another reason to love this movie. " This. And it wasn't even a 'look it up' thing at the time - we all knew Cher was in her 40s (but looking AWESOME*) and Cage was way younger and don't you think there were many "moms" swooning over this (plus it's handled really well and just a well-put together, enjoyable film with great performances and soundtrack, etc.) And Nicholas Cage was kinda new and considered hubba hubba hot stuff! (Of course, he later turned into a freak.... but an entertaining freak!) I think he was known for Raising Arizona and Peggy Sue Got Married at the time. Look at me, so focused on looks - let's see if I can come up with something a bit more substantive... but then, this movie is pure raspberry parfait - eat it up and enjoy it. The most striking image is of the moon, which is used as a romantic symbol of course but also conjures up the "wolf" metaphor and being out of control when there's a full moon. Additionally, it's just beautiful cosmic imagery to employ to try and convey the sense of falling in love. Doesn't Cher do a late night walk with the moon overhead? It's been a while since I've seen it..
As I said above, this was all about Cher really and it was a great vehicle for her to showcase her talents, you really are along for the ride with her in this one. This is one of my absolute favorite movies. It's a perfect movie. One of the bits of trivia I love about it is that this valentine to Italian-American family culture was written by an Irish-American playright. 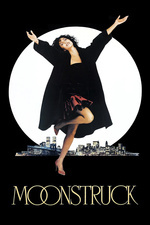 Moonstruck is a fabulous movie, hitting all the right notes of fun, pathos and schmaltz. Wonderful performances from everyone, even Nicolas Cage. I moved to the Cobble Hill/Carroll Gardens area a couple of years after "Moonstruck" came out... and was so thrilled to buy baked goods at Cammareri. I also went on a movie food pilgrimage - only mine was to the Pickle Guy on Essex Street because of my love for Crossing Delancey. Miko, Shanley talks about that a bit in this piece for the NYT on the debut of his play “Outside Mullingar.”. Heading home on the F train to Brooklyn [following a luncheon with a number of notable Irish-American writers, e.g. James Farrell and Jimmy Breslin], I thought about what I wanted to do, big picture. And I decided right then, I didn’t want to be helped, and I didn’t want to be labeled an Irish-American writer. I wanted to be a writer. I wanted to write about everybody. And for the next 30 years I did. I became a playwright and screenwriter. Italian-Americans were my particular specialty. I liked the way they talked. There was something free in it. This attraction resulted in plays and films with titles like “Italian American Reconciliation” and “Moonstruck,” and not a lot of jobs for Irish-American actors. Something in me hated being confined by an ethnic identity, by any family. In addition, I have often found procrastination to be an enriching exercise. Not saying increases what I have to say. Not writing about the Irish was building up a hell of a lot of pressure to do just that. Just watched this AGAIN (like it's possible to watch it too many times). And it's perfection AGAIN.